Several weeks have passed again since the last garden update. We had a really great crop of lettuce this year and it lasted a while in the fridge. Matter of fact – there is still one gallon-sized bag of lettuce left in the fridge to be used. While it turned off very hot again this year (and then has cooled down since), the lettuce has all bolted and is no longer looking great. 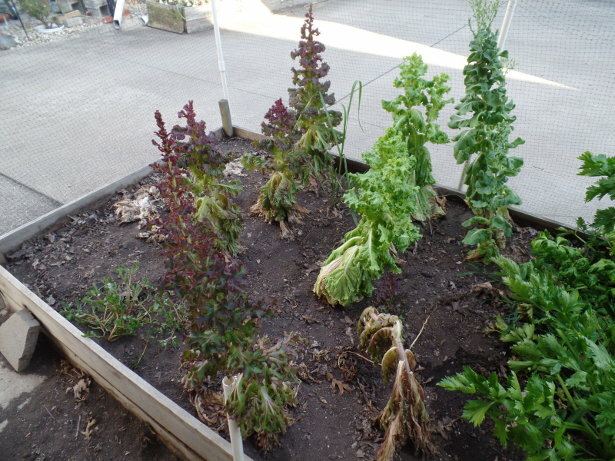 The lettuce bed was full and overflowing – now it is sparse and growing upwards. 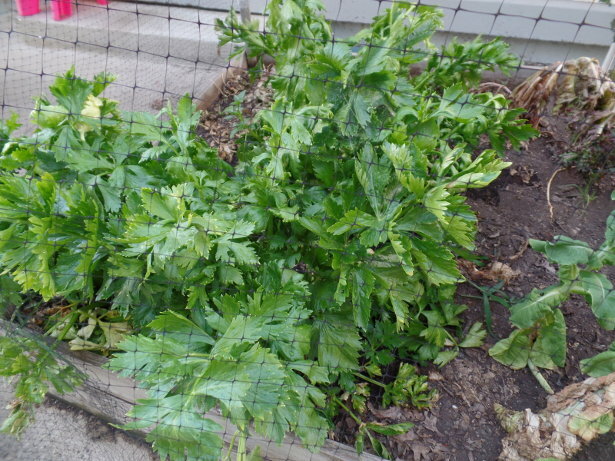 There are two celery plants left. I’ve been cutting them down as I use them on salads. 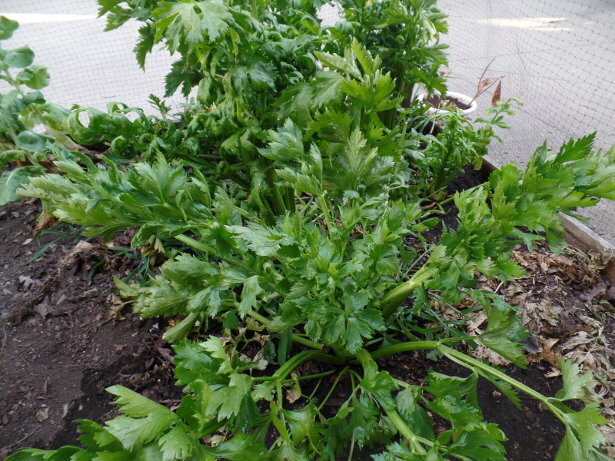 The celery is still holding up very well – just have to ensure they are watered regularly! 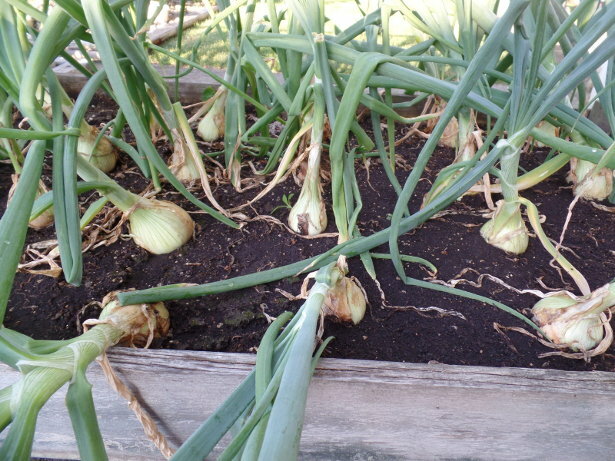 The celery pictured above was a bit dry and started to sag a bit. 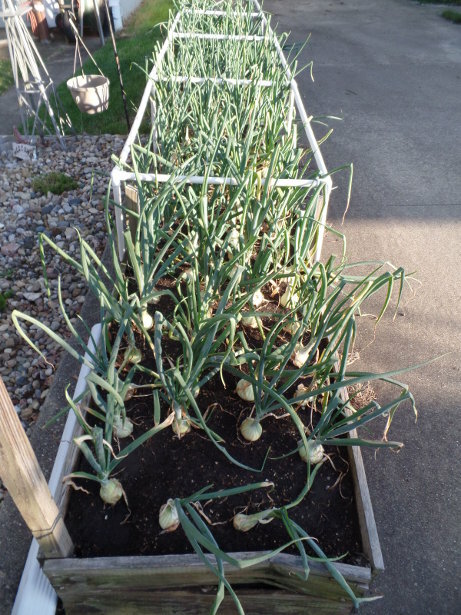 Took the pictures just after I watered them again. But, the one picture above was also cut down and used this week too. 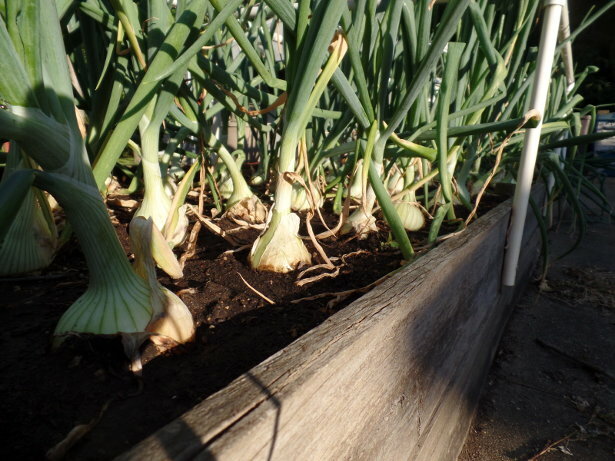 Hard to see the difference, but the onions planted first are larger and some have bent over. Hmm, well, I did get to pick a small handful of peas. Very, very few – just enough to spread over two salads. I did not take any pictures of this but the peas were also picked at least two or more weeks ago. So, that leaves us with the front garden! 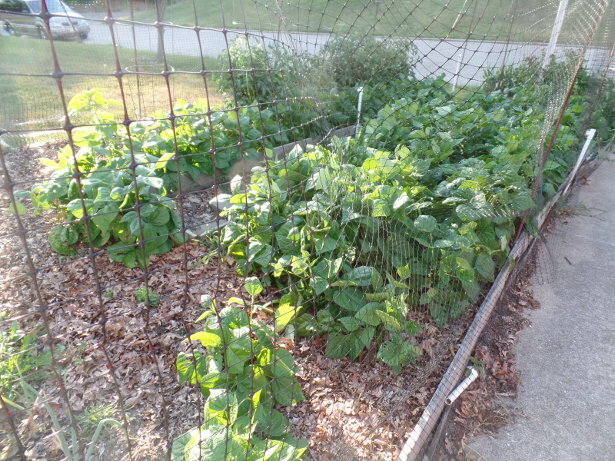 The green beans are doing very well. And so far, I’ve had great success with keeping the deer out this year! By this point, everything would have been chewed up. 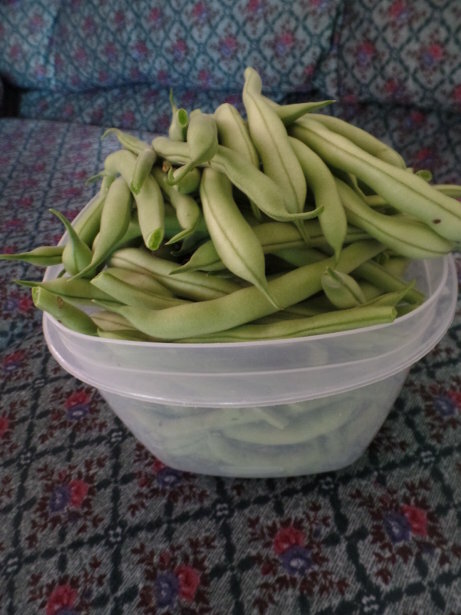 Before taking all of the pictures, I got out in the garden and picked some green beans for the first time. 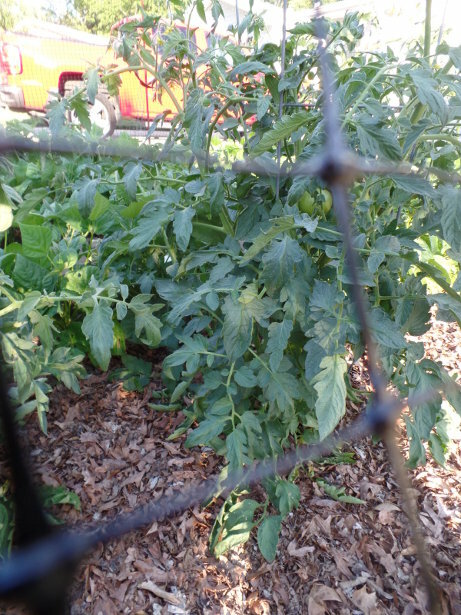 Tomatoes are also growing well. Really hoped that all six would have taken off, but two of the tomatoes I transplanted did not work. We do have some tomatoes on the vines, although I looked a little closer afterwards and some of them seem to have blossom end rot on them. And finally – a stroll through the fruit section of the front yard. First – the grapes. We’ve never harvested any grapes off the vine, not even sure what variety they are. I ordered two grape vines and the nursery didn’t send us the correct vines. One of the grape vines has since died. The grape vines are not nearly as loaded this year as they were last. 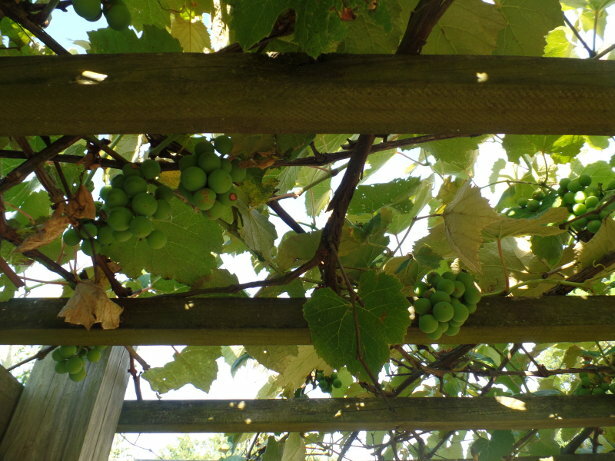 There were dozens of bunches everywhere on the vines. This year, the bunches seem to be smaller with only a dozen or so. 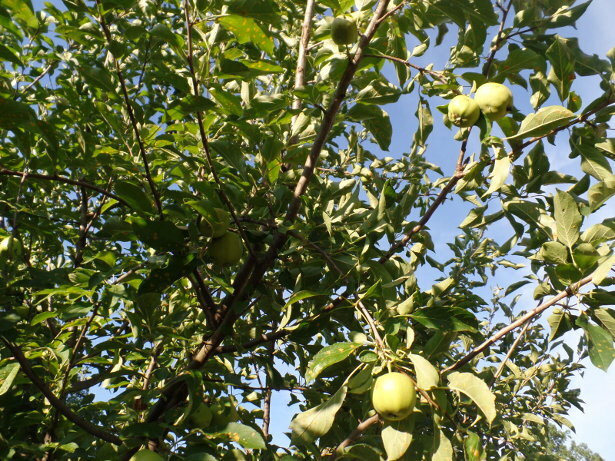 And – the Granny Smith apple tree. It is loaded with apples this year too! Last year, we had quite a few but it seemed like many of them never matured and dropped off. So far this year, they are staying on the tree. That is all for this garden post! Roberto, the owner of WhiteTusk LED Lighting, wanted to get an eCommerce website started. He has been in business for a while but requested to get a presence online to sell as well. Roberto helped us understand the layout and colors of the site he wanted by providing us an example site. We setup the site similarly and loaded all of the product categories for him. He also had another individual create a logo which is prominently displayed at the top of his site. Yesterday, the website was completed and we provided Roberto the instructions for adding products to his website. He has one product added so far and will be adding more as he can. We appreciate the business from Roberto! 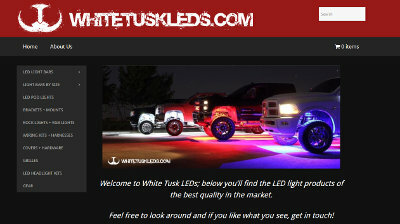 The WhiteTusk LED Lighting website is at whitetuskleds.com. Janecia reached out to us a while ago asking about our website services. She started a new business and wanted to have the ability for visitors to register for courses online. She is a certified phlebotomist and wanted to begin teaching others a certified course as well. Janecia provided us the information for the website very quickly along with an example site. Once the info was received, the first portion of the site was done within 72 hours. We then moved on to the online registration system. It will allow her to add multiple events on the site and either take a deposit or full course payment via PayPal for the registrants. Today, the site was approved and everything is completed! The website for Stepping Stone Phlebotomy, LLC is at ssphlebotomy.com. BsnTech was contacted by Tim about a month ago asking about website services. He already had a domain name and website hosting – but wanted to find someone that would handle everything for him – domain name management, hosting, and making a new website. He had a look in mind and provided us an example website that he liked. We provided an itemized estimate for a cost to make a site similar, so he picked some features that he didn’t want to save on cost. Tim sent over the info he wanted on his site promptly and that enabled us to get the site done quickly. Within about 24 hours of him placing his order, the site was completed. 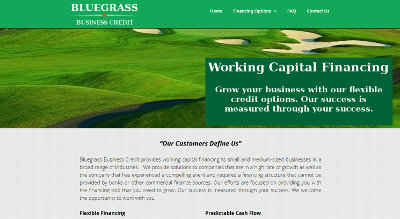 The site for Bluegrass Business Credit is at bluegrassbusinesscredit.com. Mike sent us an e-mail over the weekend asking about website design services. We promptly called him and worked with him regarding his website requirements. Mike was the owner of West Coast Investigations, LLC – which provides security and private investigation services in the Las Vegas, NV area. He noted that he had received other quotes from web designers and said ‘each time I talk to someone, the price just goes up’. After we provided our pricing to him, he immediately wanted to get started on the website. Mike wanted to ensure his e-mail accounts stayed at their current provider and that all five of his domain names would point to his site. We worked with him to ensure this was setup correctly. We then started work on the website the next day (on a Sunday) and had the majority of it completed. On Monday, the final work was completed and the website was launched! We appreciate the business from Mike and look forward to helping him with his website needs in the future. 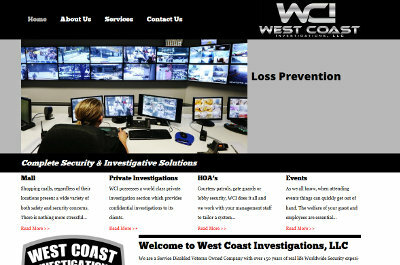 The website for West Coast Investigations, LLC is at westcoastinvestigationsllcnv.com. Joshua contacted us a few weeks ago asking about our website design services. 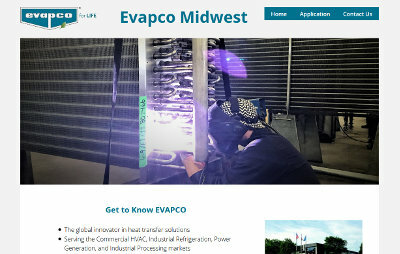 He indicated that Evapco Midwest was starting a campaign to hire individuals for employment at the plant in Greenup, IL. Therefore, they were looking to have a website that would be strictly for handling online applications for those seeking employment. The PDF version of the application was sent over and we made it into a fillable PDF file – which was one of the steps required to ensure the application would be returned to them from the website in the format they needed. Upon initial payment, we began working on the website immediately and had it completed within 48 hours. The website is now live and ready for applicants! We appreciate the business from Joshua and Evapco Midwest. The website we created is at jobs.evapcomw.com. Phillip, a current customer of BsnTech, contacted us several months ago to create a new website for him – Coates Music Studios. We worked with Phillip and his partner to get the website up and running. With the amount of material needing added to the site, it did take several months to piece everything together. This is an upscale, premium website that was created for Coates Music Studios. After the main website was completed, Phillip wanted to move on to the next project – adding a Beats store to the site. We helped by setting up the installation and theme for them and allowed them to finish the rest of the setup to save on cost. We appreciate the continued business from Phillip and hope we have exceeded his expectations with the services we provide. 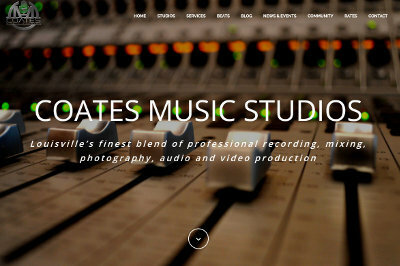 The website for Coates Music Studios is at coatesmusicstudios.com. Lloyd contacted us a few weeks ago asking about making his website search engine friendly. His current website was completely made of images – including the text. Therefore, search engines were unable to recognize or read through the material on the site and rank his site accordingly. After we understood what Lloyd fully required, we got started on the site. Within 24 hours, we had the site mostly completed. Lloyd needed a few changes to the site since we were making the new site anyways – and we included some PDF files of downloads. On Friday, the website was approved. It was just launched today! 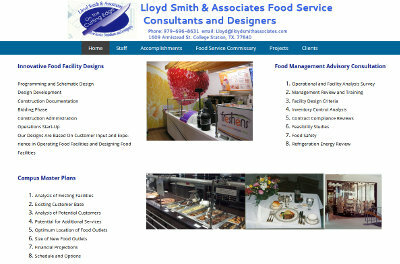 The website for Lloyd Smith & Associates is at lloydsmithassociates.com. Bill and Dana, current customers of BsnTech for several years, contacted us last week asking to get a website created for a property they have listed for sale. 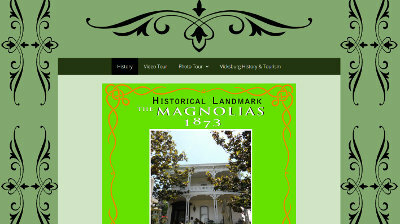 In Vicksburg, MS – they purchased a historical landmark home called The Magnolias. They fully restored the home and are now ready to sell it to another family. They provided 100+ pictures which were all resized and put in the gallery along with some historical information about the home and about Vicksburg, MS. Later one, they will also provide a video tour of the grounds and inside of the home. Today, the site was just launched to get it recognized by the search engines. The website is at historicpropertiesofvicksburg.com. Kenneth from Valley Industrial Battery e-mailed us needing help with a website. Initially, he was asking about creating an eCommerce site. After some additional e-mail communications, he asked us to start a simpler website first for his battery company. Kenneth had created a website for his company in the past but had taken it down. He provided us a location on the archive.org website which had archived his old site. We used the information from the old site to put together the new site and changed the design of it. He also asked us to create a slideshow on the home page and link to some literature files from his distributor. Yesterday, the website was considered completed and it is now published! 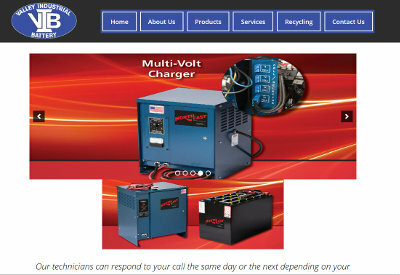 The website for Valley Industrial Battery is at valleyindustrialbattery.com.